Sadly, this is the last week of the MeMeTales Readathon. We hope you had a great time with all of the ebooks you read and please know that by participating you've helped donate over 6500 meals to hungry kids via FoodforEducation.com! And just in time for the Olympics, this week's theme is Global Culture. Books this week include Mandy and Pandy Say "Ni Hao Ma? ", Cora Cooks Pancit and Good Fortune in a Wrapping Cloth. I had a lot of different ideas for this, including animals of the world, some puppets and a multi-cultural puzzle. But when I was getting ready to set up the map of the animals of the world, I suddenly remembered some soccer jerseys. A few weeks months ago the Farmer had an idea for one of his soccer magazines (they come by the 100s at our house...okay, maybe not 100s). "You should make paper doll clothes out of the jerseys." I said it was a good idea and even got as far as tearing out the jerseys, but then they sat and sat and sat. Until today! The Farmer didn't think they were National Team jerseys, but guess what?! They were!!! I cut out 13 jerseys and had the Farmer explain to me which one represented which country. The Farmer helped us set up, then went into the living room to play with Sprout (he wasn't in the room to make sure I kept my jerseys straight!). NOTE!!! I somehow mixed up the Mexico/Spain jersey. It was a Spain jersey and I kept telling Sweet P it was Mexico. Something tells me I'm not making many friends with Spain/Mexico soccer fans. 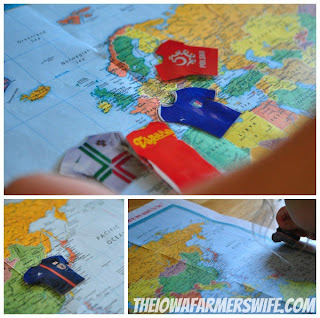 We spread out a World map and Sweet P and I talked about each country the jersey represented. I'd show her where the country was and she'd lay the jersey on top of it. I think she liked looking at the map more than anything. After the map match, she moved on to dress-up dolls. 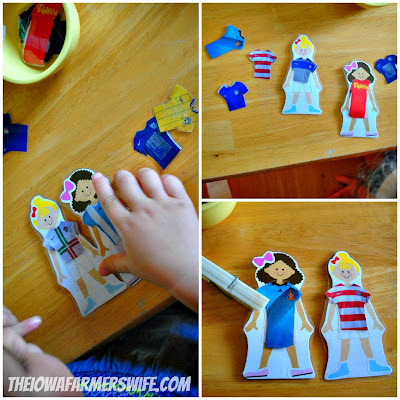 We used two sticker dolls from our Melissa & Doug Fashion Sticker Collection as our paper dolls. I gave the Sweet P the option of using tape or a clothes pin to adhere the jerseys. 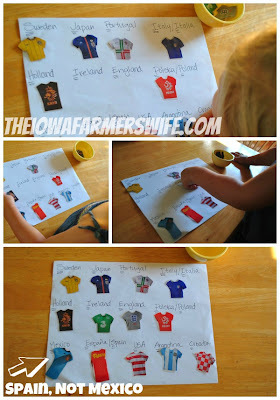 Once she finished playing with the dress-up dolls we did a match game with the names of the countries and the jerseys. I'd say "This is the USA jersey, can you find USA?" and she'd go hunt for the letters. It was a challenge, especially since we had Poland and Portugal, and Ireland and Italy, but she figured it out. Another NOTE: Soccer plays a big role in our household, especially since the Farmer coaches 2 teams, so this was a really fun activity for us. The Farmer was really excited about it and it was a really fun way to teach her about other countries with something other than flags. MeMeTales is giving away 6 "What Does it Mean to be Green" books and posters AND 6 Let's Go Chipper Activity packs! Enter via Rafflecopter for a chance to win!